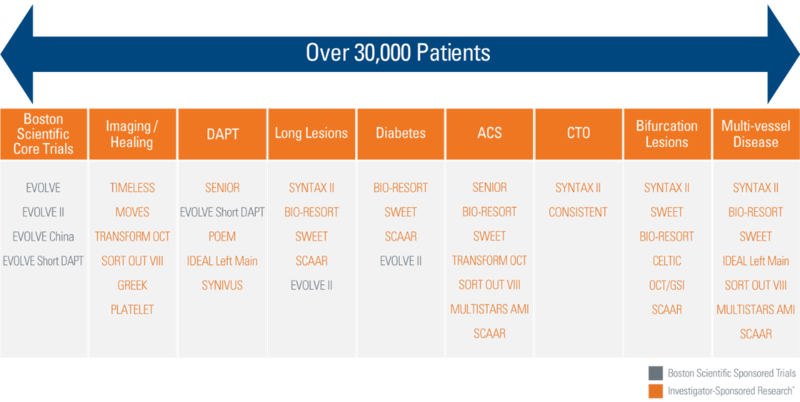 The SYNERGY™ Bioabsorbable Polymer (BP) Stent is being studied in 20 investigator-sponsored research trials including more than 30,000 patients, allowing physicians worldwide to provide data on patients receiving the SYNERGY BP Stent. We are investing in the science to address significant unmet clinical needs. We are the only company running an IDE trial to evaluate a 3-month DAPT regimen in BP-DES patients with a high bleeding risk. * Boston Scientific is not responsible for the collection, analysis or reporting of the investigator-sponsored research output which is the sole responsibility of the investigators. Boston Scientific’s involvement in investigator-sponsored research is limited to providing financial support for research that advances medical and scientific knowledge about our products. † CEC confirmed MI/TLR/ST Day 901 in the SYNERGY arm 37 y/o male patient had 1,1,0 distal RCA/PDA bifurcation lesion, and a second lesion in the mid-LAD treated during the index procedure (patient was discharged on DAPT [clopidogrel]. On day 840, patient had TLR of 75% in-stent restenosis of the distal RCA/PDA lesion performed with drug coated balloon (patient was discharged on DAPT [prasugrel]). On day 901, patient developed severe chest pain, ST elevation and marked elevation of cardiac enzymes. Found to have ST of RCA/PDA lesion, which was successfully treated with another stent. ITT; Patients who did not receive a study stent were censored at 1 year; KM Event Rate; log-rank P values. Watch Dr. Dean Kereiakes and Prof. Ian Meredith discuss the 3-year results from the EVOLVE II Trial and the body of evidence supporting the SYNERGY BP Stent. The EVOLVE II Diabetic Substudy led to the indication of the SYNERGY BP Stent for use in patients with Diabetes Mellitus. The EVOLVE first human use trial demonstrated outstanding long-term safety and performance with the SYNERGY BP Stent.